When we're creating our designs, they are rarely perfect in their initial shape. Instead, they are constantly evolving as we make changes. We need a way to track these changes as our designs evolve. Most organizations do this through a revision table. What is SOLIDWORKS PDM Revision Table Integration? Previously, in 2017, there was a disconnect between revision tables and the revision property in the SOLIDWORKS PDM vault. Updating a change on the revision table didn’t necessarily correspond to the same alteration that was listed in SOLIDWORKS PDM. Now, in SOLIDWORKS 2018, our revision tables are directly integrated with SOLIDWORKS PDM. When we add a new change to a drawing, we are given a placeholder, rather than the next letter in the revision sequence. This is because the change has not been approved yet, and the revision number is controlled by SOLIDWORKS PDM. Comments can be added to the revision table, but the approved field remains blank. When the drawing is checked in, the information that was added to the revision table carries over to the revision information on the PDM data card. How does SOLIDWORKS PDM Revision Table Integration improve your workflow? After the drawing has been approved, the workflow transition sets the revision and the approver, and updates those fields on the drawing as well. The revision table, callouts and title block now contain the updated information. 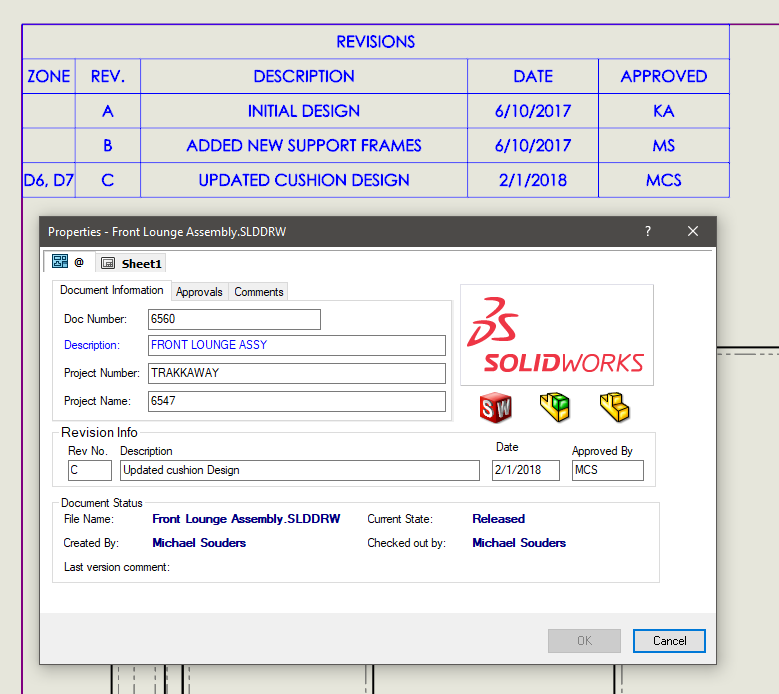 This new bi-directional communication between revision tables and SOLIDWORKS PDM will make sure that everyone on the design team is on the same page, as well as remove the frustration of coordinating revisions in multiple locations. Want to see more of our engineers' top 11 SOLIDWORKS 2018 features? Stay tuned to our blog, or download the infographic below!